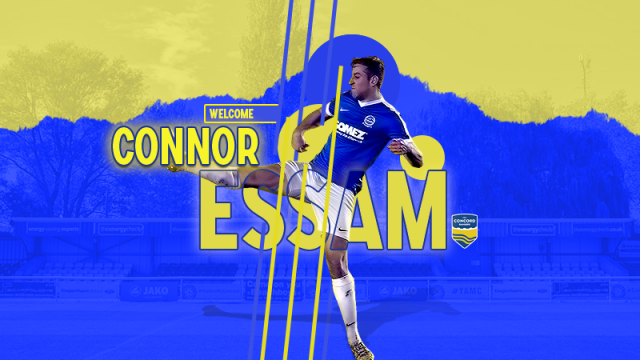 Concord Rangers are pleased to announce the signing of former Gillingham, Luton Town and Leyton Orient player, Connor Essam. Most recently at National league side, Dover Athletic, Connor has played for a number of clubs across non League and the football league. Coming through the ranks of the Gillingham youth section in 2012 Connor was given his debut for the Gills in a 2-1 home defeat to Southend United. He went onto make a further 17 appearances for Gillingham over the next year aswell as having loan spells at 4 different clubs (Bishops Stortford, Dover Athletic, Dartford and Luton Town). In January 2013, Crawley Town snapped up Essam from Gillingham on a free transfer, Connor would go onto appear 11 times for Crawley Town and scoring 1, he also in that time was sent on loan to then National league side, Dartford where he also scored a goal in his 4 games there. The following season Connor joined Dover Athletic and appeared for the ‘Whites’ 38 times in his season there, scoring an impressive 4 goals from the centre half position. This impressive season gained interest from the football league where league 2 side, Leyton Orient signed him following a successful trial at the O’s. The defender spent a season at Brisbane Road making 24 appearances across the season, during this time he also had a loan spell at National league side, Dover Athletic where he played the season before. Following his release from Leyton Orient at the end of the 2015/16 season, the 6ft Centre back joined National league side, Eastleigh where he signed a one year contract at the ‘Spitfires’, he made 11 appearances in the season, during his time at Eastleigh, Essam joined fellow National league side, Woking on a 93 day loan deal but this was short lived, 1 month into his loan deal, Essam was recalled by Eastleigh due to a injury crisis. A second spell in the latter stages of the season saw Connor join Dover Athletic once again, he made 16 appearances during his loan spell there and scored 1 goal. At the end of the season Connor agreed to depart from Eastleigh, he then found himself back at Dover Athletic where he made 35 appearances and scored 1 goal before leaving on loan just under a fortnight ago where he’s now joined Concord Rangers until the end of the season. Please join us in welcoming Connor to the club!